Trust schools have been working together to consider curriculum provision against the Trust’s working values and principles as well as Ofsted’s proposed curriculum definition from September 2019. What are we trying to achieve through our curriculum? How far do we consider the quality of the curriculum in each subject? 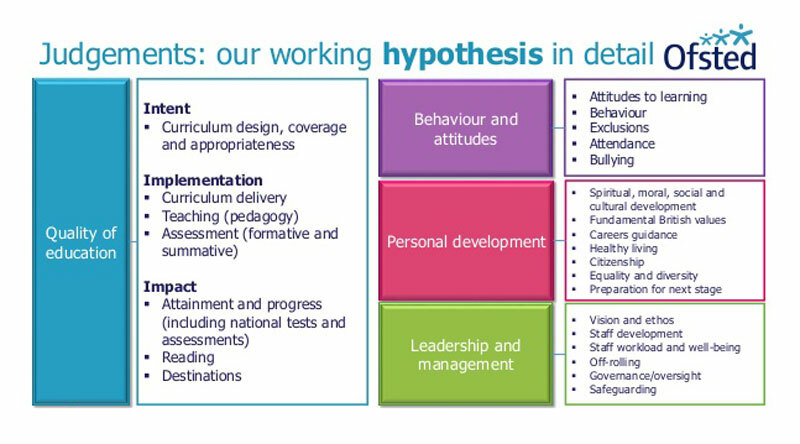 How is our curriculum being delivered? How effectively do leaders and teachers consider the content and sequencing of the curriculum in each subject area? What difference is our curriculum making? How well are pupils learning the content outlined in the curriculum? We have considered our curriculum plans in relation to the proposed new Ofsted Framework to be introduced from September 2019. Trust schools support learners in their journey from early years to adulthood through cutting edge inspiring, purposeful learning experiences. Pupils develop rigour of thought, resilience and a positive outlook whilst gaining the knowledge, skills and experience required for lifelong learning. These are underpinned by an inspiring, engaging and challenging curriculum, shaped by evidence of what works and real-world practice. disseminating the knowledge gained from enquiry and research both internally and externally in ways that bring teachers together to reflect, work on and share effective pedagogy. As a Trust that places pupils at the heart of its endeavour our aim is to develop confident, enthusiastic and aspirational learners. We want to foster a strong sense of self in everyone. This enables individual learners to flourish and realise their potential in a non-judgemental and mutually supportive environment. Our pupils are active participants in shaping their learning through rich experiences whilst also gaining an understanding of social diversity, cultural relevance and global perspectives. We recognise, value and celebrate pupil voice. We do this to support pupils to develop purposeful initiative, autonomy, self-worth and to help them build positive and constructive relationships with others. Trust schools develop respect for every individual and for others through a set of shared values. We respect and rejoice in the diversity of humankind, being positive and open to differences in a fair, equal and democratic society. Our schools promote mutual respect between all members of the community and the wider world, building the skills that equip pupils to consider different viewpoints carefully. Pupils experience social, moral, spiritual and cultural education that broadens their awareness and understanding of the world and prepares them to become contributing global citizens.